Exo-solar planets [sometimes called extrasolar planets] are worlds revolving around other suns. Over 647 of these planets have been discovered as of November, 2011; most by observing the 'wobble' of the parent star that is induced by the planet as it revolves around the star. If the exo-solar planets orbit is aligned between its parent star and Earth, the eclipse or transit of the planet in front of the parent star will block a small amount of light from the parent star and diminish its brightness to an observer on Earth. [Click the Play tab on the figure below] By carefully measuring the brightness of the parent star during this transit and plotting the light intensity vs. time, it is possible to learn much about the exo-solar planet. A compendium of information about exosolar planets is located at the Extrasolar Planet Encyclopedia. 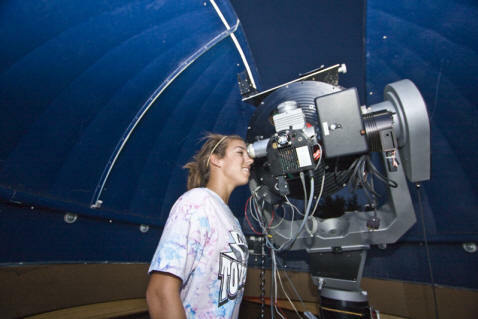 Alyssa spent several nights at the scope and in the observatory taking data. High school student CAN do meaningful scientific research...and it's fun! On the evening of June 4-5 of 2009, the author was part of a team observing the exo-solar planet HD80606b. The team was headed by Josh Winn and John Johnson. It included observers from Boston to Hawaii. At the time, this exo-solar planet had one of the longest orbit of any observed exo-solar planet, 111 days. HD80606 is a double star system with HD80607. The presence of this second star is though to cause the highly elliptical orbit [0.93] of this exo-solar planet. 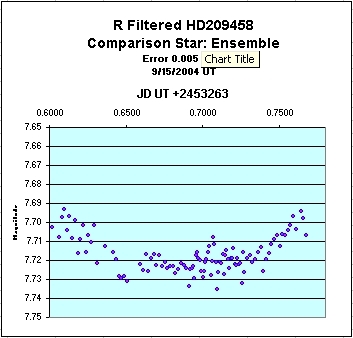 Although HD80606 had not been highly observed in the visual, the purpose for these observations was to determine the spin axis of the parent star using a technique called the Rossiter-McLaughlin effect. It turns out that the star does not rotate on the same axis as the orbit of the planet as does our Sun, but is offset somewhere between 32o and 87o. Winn and Johnson published their finding and the paper is available at: http://arxiv.org/abs/0907.5205 . The author's observations were only a small part of the total observation set. They are shown as observations marked by the green squares [De Kalb] in the graph below. 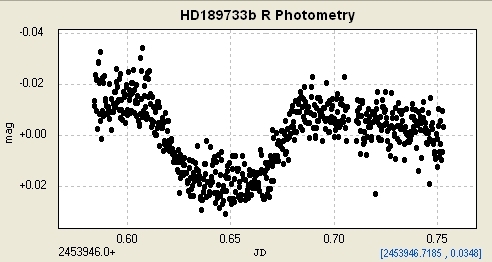 The exosolar planet HD189733b was detected in Oct. 2005 using radial velocity measurement by F. Bouchy at the Haute-Provence Obs. in France. The planet has an orbital period of 2.219 days and a mass of 1.15 Jupiters. The parent star, HD189733, has a mass of 0.82 Msun and is a spectral class G5; very similar in color and mass to our own Sun. 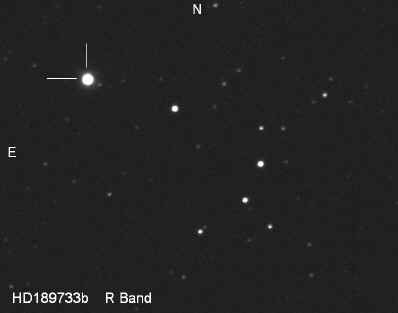 HD189733 is located in the constellation Velpecula approx. 60 light years from Earth. 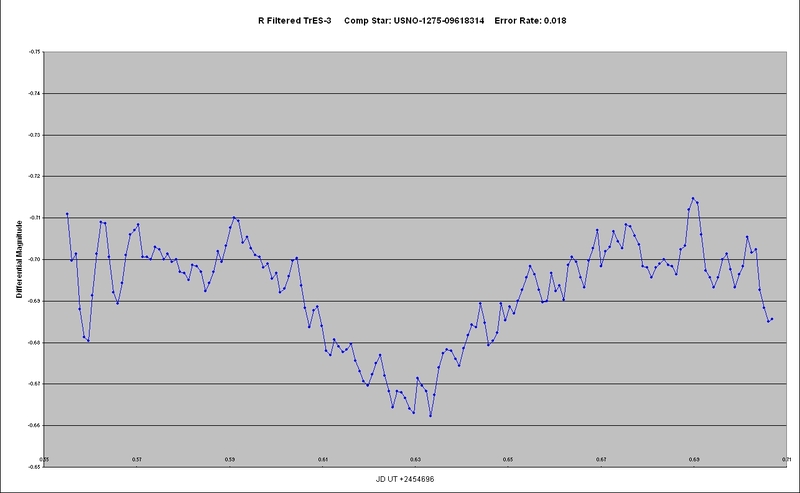 The graph below plots the brightness [magnitude] of the star over the course of 4.8 hours. As the exosolar planet passed between its parent star and Earth, its shadow diminished the magnitude of the star by a factor of ~0.4% The ingress and egress angles of the light curve can be used to project the diameter of the exosolar planet. 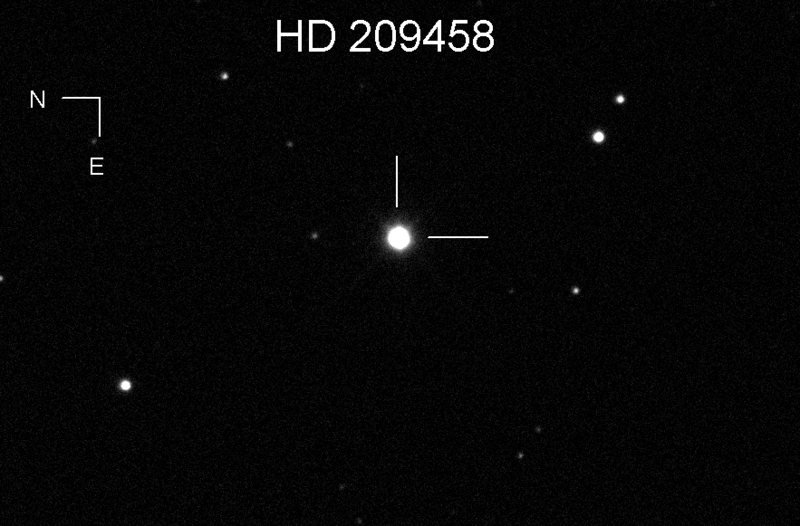 The exosolar planet HD209458b was inferred by the detection of stellar wobble. This discovery was made by Marcy and Butler of the Carnegie Institute on Nov 4, 1999. The exosolar planet was first detected by photometry on Nov 7, 1999 by Greg Henry of Tenn. State Univ. Although the estimated diameter of the planet is 1.6 times that of the gas giant Jupiter, the density is only 63% that of Jupiter, making the planet a gas giant, also. 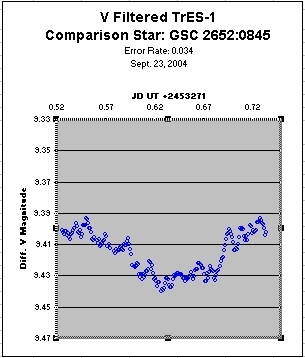 The author was able to detect the transit of the planet in front of the star in R band photometry on Sept. 15, 2004. Over 500 images were taken and the average photometric magnitude was calculated for groups of 5 images [boxcar averaging]. A graph of the R band magnitude vs. time is shown below. The Hubble telescope had detected both Sodium and Hydrogen in the atmosphere of HD209458b. 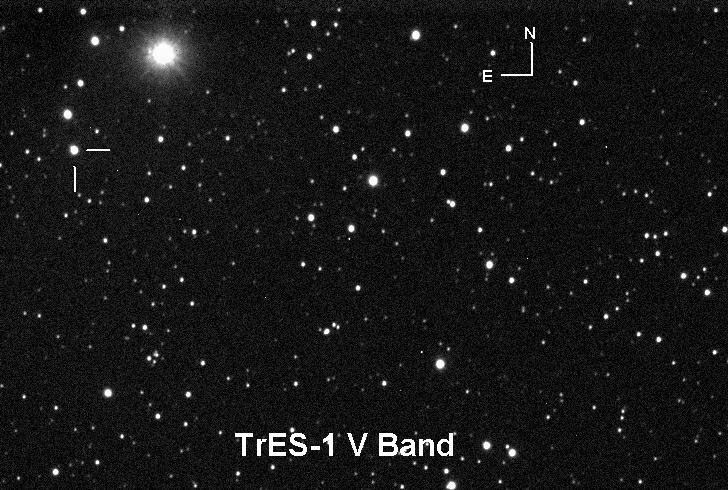 The author was able to detect the transit of the planet in front of the star by V band photometry on Sept. 22, 2004. Over 200 images were taken and the average photometric magnitude was calculated for groups of 5 images [boxcar averaging]. 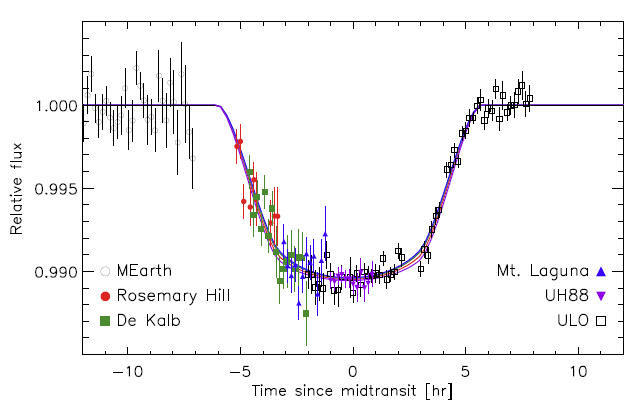 A graph of the V band magnitude vs. time is shown below. The difference in the slope values for the ingress and egress lines is thought to be caused by a relativistic effect as the planet orbits the nearby star.